The Abuja division of the Federal High Court on Thursday nullified the suspension by the Senate of Delta Central Senator Ovie Omo-Agege, describing the action as unconstitutional. In his one hour judgment, Justice Nnamdi Dimgba conceded that the National Assembly had the power to discipline its erring members, but the grounds upon which Omo-Agege was suspended were illegal. 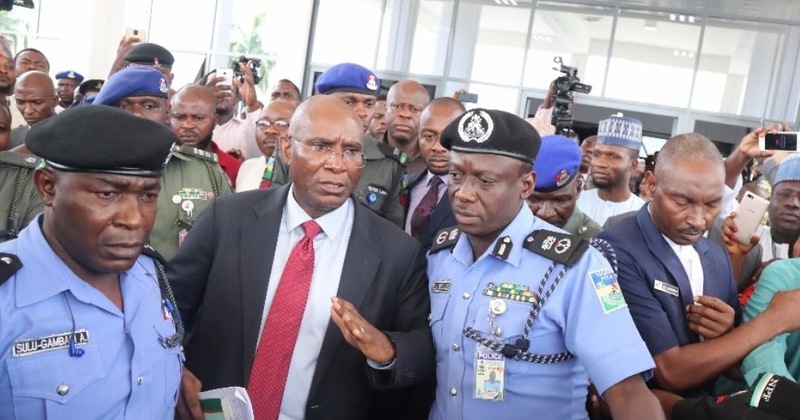 Omo-Agege was suspended during plenary over the remarks he made at a press conference that the amendment of the 2010 Electoral Act, which changes the sequence of elections set by INEC, is targeted at President Muhammadu Buhari. The Senator had however on February 21, 2018‎, apologised to the Senate over the remarks. Senate Committee on Ethics and Privileges had recommended in its report that Senator Omo-Agege be suspended for 181 legislative days, but Senate President Bukola Saraki recommended that it be reduced to 90 legislative days. Presenting the report on the investigation into the comments made by Omo- Agege, Committee Chairman Senator Sam Anyanwu said that the Committee found it unacceptable that after Senator Omo-Agege apologized to the Senate over his comments, he made a u-turn and took the Senate to court over the matter which was referred to the Committee. Senator Omo-Agege, alongside nine others, had accused the National Assembly of deliberately adopting the conference report on the amendment which they allege had a pre-determined motive targeted at President Buhari. The Senate resolved to reduce the length of the Senator’s suspension and also asked him to withdraw the court case he had instituted against the body. The Senate has also disbanded the parliamentary support group which Senator Omo-Agege and embattled Senator Abdullahi Adamu belong to. ‎Before his suspension from the floor of the Senate on April 13, Omo-Agege had filed his suit on March 26, 2018. In the said suit, Omo-Agege sought, among other prayers in his suit, a declaration that his referral by the Senate and the Senate President’s referral to the Senate Committee on Ethics, Privileges and Public Petitions “for trial for expressing his opinion on the purport” of the bill “is an act calculated to interfere with or likely to constitute a breach” of his fundamental human right to freedom of expression without interference. He argued that his rights, allegedly breached by the Senate, were guaranteed by Section 39 of the Nigerian Constitution and Article 9(2) of the African Charter on Human and Peoples’ Right (Ratification and Enforcement) Act. He joined the Senate, its President, Dr Bukola Saraki and the AGF as the first to the third defendants, respectively. Delivering judgment on the suit, the federal court agreed with him that his suspension by the Senate was indeed an act of illegality. Although the Court did not grant any of the seven reliefs he sought, ‎it held that the suspension could not hold on grounds of the “violence” it did to the Constitution. Justice Dimgba noted that, from the wording of the report of the Senate’s Ethics and Privileges Committee, which recommended Omo-Agege’s suspension, he was punished for filing a suit against the Senate after apologising to the legislative house over the allegation leveled against him. Dimgba also ruled that the principle of natural justice was breached by the Senate’s Ethics and Privileges Committee by allowing Senator Dino Melaye, who was the complainant, to participate in the Committee’s sitting that considered the issue and also allowed him to sign the Committee’s report.